Posted on April 6, 2016 by No Map Required Posted in Art, Art & Engineering, Places, United States, Washington	. As we work our way through the mental re-entry-into-Seattle-life challenges, Anner and I both have been getting the itch to do something creative. We haven’t had a lot of time yet, what with job hunting, painting the walls (not really so creative), bringing the garden back to where we enjoy seeing it again (mostly weeding), getting together with friends and clearing out stuff we don’t need, but this week I just couldn’t take it anymore! The studio called and off I went, if only for a couple of hours. What did I do? Well…make these! A couple of new handles to replace ones our renters broke! 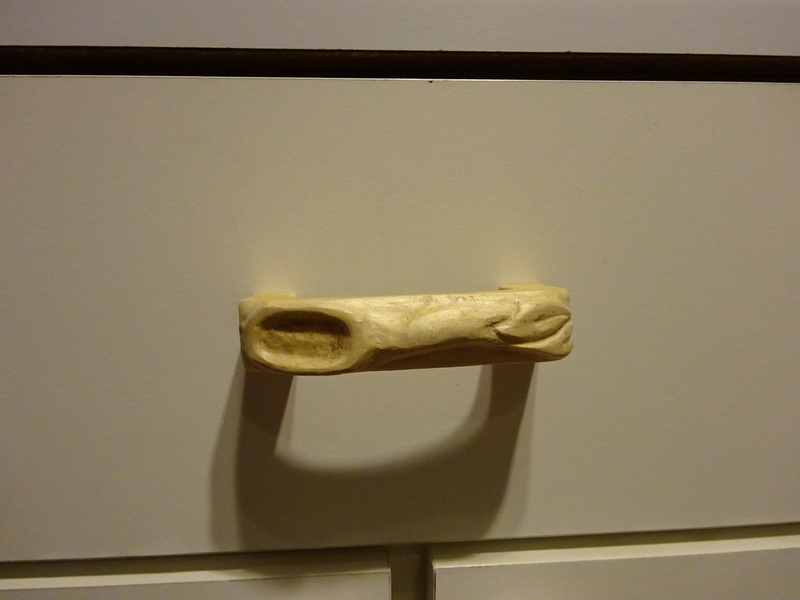 First I made up a new kitchen drawer pull for one of our utensils drawers. You know, the one with all the measuring cups, random cake icing spreaders, and the all-important ice cream scoops! I went with a “rustic carved spoon with leaves” motif, just to get a feel for working with my tools again without the pressure of a precise design. 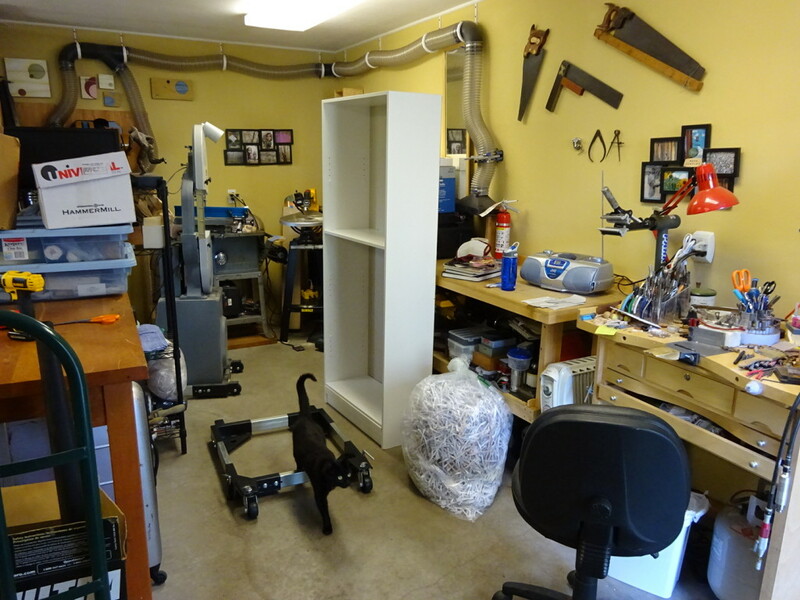 As you can see, the studio is still in a bit of disarray, but I did the base cutting with my scroll saw in the back corner and then all the carving and sanding at my jeweler’s bench up front. Emily, our wonderful neighbor cat, supervised my photo shoot this morning. Felt good to be back working again, even if there’s still a shelving unit in the way! A little more restrained for this lower cabinet pull. 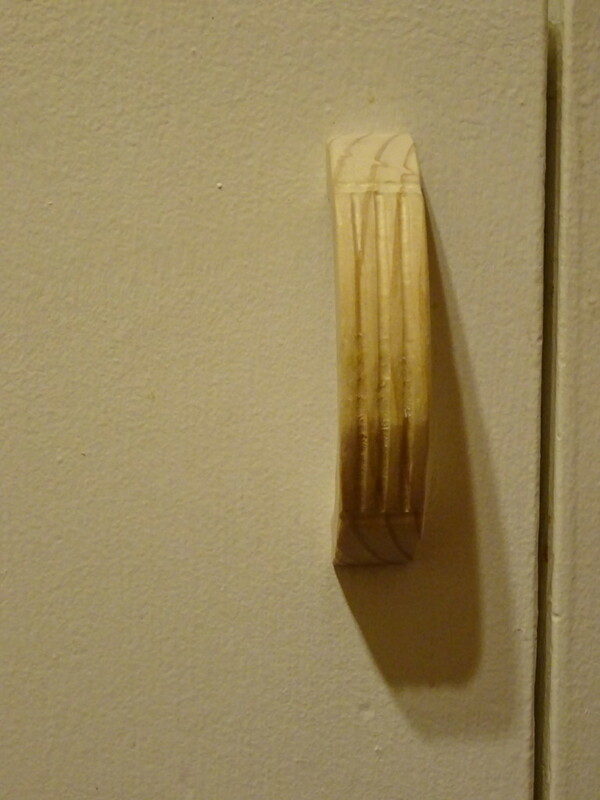 Yep, there was a broken handle on one of our lower kitchen cabinets, as well. Now it sports it’s own new pull! I felt more restrained this time, especially as it was going to be well below eye height. I’d like to think my “carved grooves” design adds a little touch of elegance to our kitchen, but I’m not sure that’s true. At least we can open the cabinet now! Perhaps a little nicer than our cheap, plastic handles…even if it doesn’t match the white very well? These really were a way for me to get a little studio time while also doing a quickie house fix. Please don’t judge me too harshly – I know they don’t look great against the white – but they do work nicely! Perhaps someday I’ll be inspired to do the whole kitchen using a nicer, darker wood. Hmm… 21 handles… okay, maybe that’s a project rather far in the future! Anner here – hijacking Aaron’s post. My response to these artsy, rustic, don’t-quite-match additions to the kitchen? 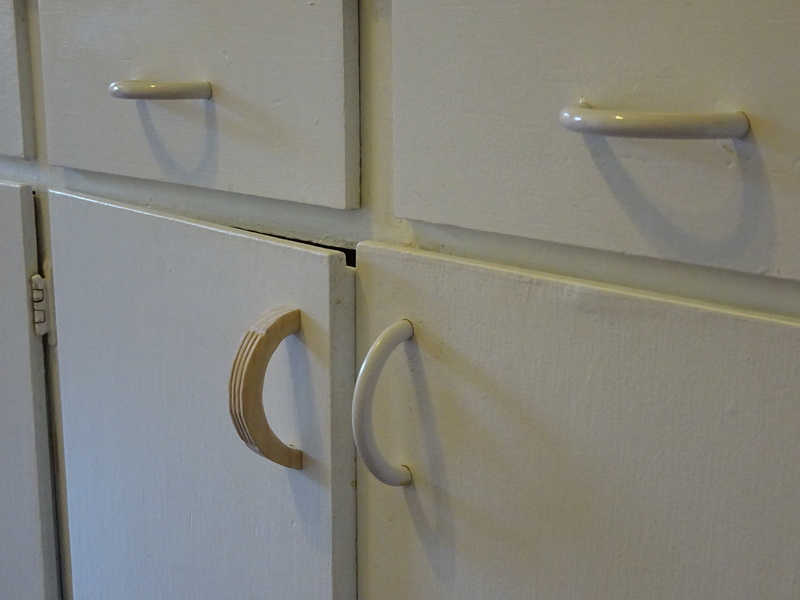 “Hey, while you’re out there, why don’t you just make all new cabinets to match the handles?” I figure it’s the Mongolia of domestic projects — much harder than we can possibly understand and would be a massive accomplishment when its finished. Go, Aaron, go! Team work! Someone has the ideas and someone does the work!